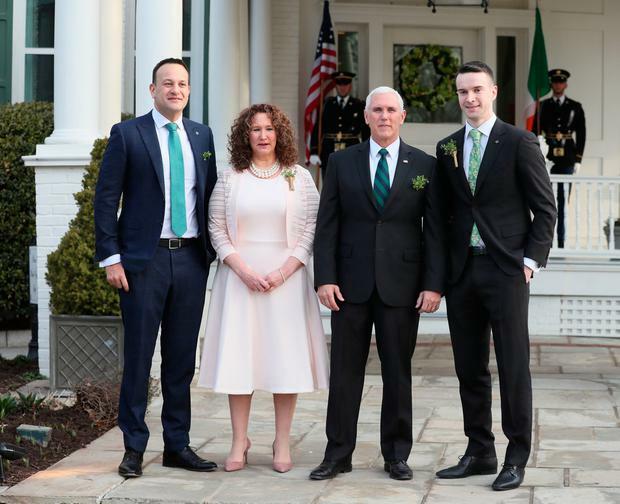 Sir – Donal Lynch does a benign ‘lynching’ job on Leo Varadkar’s penchant for relentless self-promotion, fickle capriciousness and blatant ‘U-turnisms’ en route to and throughout his tenure as Taoiseach (‘Leo’s the man to preach to Pence’, (Sunday Independent, March 17). In Lynch’s wide-ranging swathe of ‘recalls’ from yesteryear, the “young fogey” Varadkar would not appear to have covered himself in much steadfast consistency or principled dependability. Whichever way the electoral wind blows, it could well be the Taoiseach’s more than variable yardstick of opinionated utterance, sporadic gusts of changeable direction regularly featuring. The recent ‘shamrocked’ dalliance with US Vice-President Mike Pence offers a clear vista of how one can bury the ‘true-self’ ideals in deference to current realpolitik in the age of social media and the 24/7 immediacies of global media coverage. Biting the bitter bullet of contradictory personal interfaces is just one of those oxymoronic gestures of ‘goodwill’ to be endured by all wannabe politicos who, more than any paltry principle, want to cling to protracted power while posting positive ratings at home and abroad. Such a pattern of behaviour “opens the Taoiseach to charges of hypocrisy”, as Donal Lynch suggests. But, hey, who needs authenticity when the paparazzi are around to boost and bolster the ‘likeability’ quotient, to say nothing of electoral windfalls and attendant power attenuation? Donal Lynch should be highly commended for illuminating the galling ‘gallows’ of political validity at play. A valuable lynching by any standards, but will the ‘drop’ come soon enough? Sir – I write to you as a concerned citizen and business person at the tone of debate in our country on Brexit. I believe our Government, far from leading and healing, has actively stirred emotions for short-term political gains. I have been greatly impressed by the courage and clarity of your writers Eoghan Harris and Jody Corcoran. They alone, with the possible exception of Newton Emerson, have provided some balance in the media on this historic issue. Sir – It is recently noted that Ruth Dudley Edwards is departing the Sunday Independent. Many will heave a sigh of relief that Ruth’s anti-Republican column will no longer be available, so her enemies will be deprived of the weekly opportunity to spit on her image. However, an alternative point of view is welcome, notwithstanding that such opinions rendered by colourful and entertaining but essentially uncreative scribblers, such as herself and Eoghan Harris, promote points of view dangerously detrimental to the future of this country, such as the notion the backstop should be scrapped to facilitate the ruinous positions of the DUP and the fanatical Brexiteers of Rees-Mogg and his ilk, who don’t give a fig for Ireland, north or south. In spite of all, as Samuel Beckett might say, everybody is entitled to their opinion, and it is this even-handed attitude to all sides of an argument which makes the Sunday Independent both a compulsive weekly read and a very necessary upholder of democratic values. Sir – I don’t understand An Taoiseach’s concern about Ireland and Northern Ireland existing in different time zones. Any cursory look at our recent mutual history leaves little doubt but that we are already existing in different time zones. Furthermore, as we have also been existing in different universes for quite some time, the chances of a single time zone is as remote as the House of Commons’ capacity for any positive vote on Brexit or the DUP agreeing to a border poll. Sir – I never thought I would see the day I would be grateful for the men and women who make up our Government. I have a new appreciation for Leo, Micheal, Mary Lou and all the others in Dail Eireann. Looking across the water has confirmed the grass is not always greener. Sir – Liam Collins’s excellent obituary (Sunday Independent, March 24) of Richie Ryan makes no mention of his able auditorship at the UCD Debating Society, the L&H, where hundreds of us students saw – and heard – him in action on Saturday nights! Sir — We, the nation, need to debate this subject. I am now in my 70s and expect to end up in a nursing home with dementia. I expect to get life-ending conditions, like pneumonia, and would like to be left in peace with no or minimal treatment, to pass away where I stand (home or nursing home). I do not wish to be transferred to hospital to sit on a trolley and inevitably be treated by some junior doctor who feels that he/she is doing their best, only to be discharged to repeat the process at some time in the near future. While still compos mentis, I am happy to sign to this effect and will ensure that my immediate relatives are aware of my views. My nursing home would need 24-hour cover by my local GP practice, who would be familiar with my wishes, but my GP friends laugh at this suggestion of an out-of-hours’ call, despite most nursing homes in the large suburbs being adjacent to large GP practices with enough doctors to provide the service. An emergency doctor, although usually very experienced, is terrified of ending up before the Medical Council and is going to “turf me” to A&E. I would be delighted to have a beautiful, happy nurse looking after me in my nursing home, but they might be from one of the few practising Christian groups left in the world, and don’t like to let people die —which is another reason I need a doctor with imprimatur to look after me and let me die in peace. Lastly, I am sure deaths on the premises don’t suit nursing home managers. Paradoxically, in my book, nursing homes with the highest mortality rates should get the best grades. This would significantly reduce bed occupancy in hospitals, but needs the full backing of GPs, and if they won’t, provide the service we need to expand the HSE pre-admission emergency service, providing a dedicated nursing home and home service to keep me out of A&E. Alternatively, the hospice service could be expanded, but without 24-hour cover, the system fails. It took a long time to drag us into the 21st Century with relation to contraception and abortion, for once maybe we could be pre-emptive and be one of the first to introduce euthanasia, which will inevitably come at some stage. Sir — I was raised in rural Galway in the 1960s, and my mother gave birth to eight children — one after another. In those days in Ireland, even when women followed the clergy’s rules and had babies that perhaps they did not even want, the babies still had to be “churched” as they were deemed ‘dirty’ after birth. It is with this social background that I write the attached poem honouring the child that was within my mother. It’s a poem for a mother long gone. that outed her — the skittish girl. rolling raglan sleeves of wool. Sir — I no longer buy cards or presents for my mother on Mother’s Day, unfortunately she passed away over 25 years ago. But I often think about her, not just on Mother’s Day. I think of the woman widowed, with two children and another born five days after her husband died. Left without a husband or a home she reared us in a rented room in another family’s house, as was the norm at the time, until she got a house of her own. She was both father and mother to us, took whatever work was available, scrimped and scraped to ensure our survival. Nothing was ever wasted, she was recycling before the word was invented. She neither drank nor smoked, she loved her garden and I think she was happy with the way we all turned out. Her name was Nora and she was the best mother that we could have wished for. Sir — A quarter of our species in Ireland (birds, mammals, insects and wild plants) face possible extinction. Birds like the corncrake, skylark, curlew, and yellowhammer have all but vanished. The Irish hare, hailed in song and folklore, has been in decline for 50 years due to loss of habitat from modern farm practices and urbanisation. And how do our politicians respond to the plight of these creatures? The National Parks and Wildlife Service (NPWS), which works so hard to conserve and protect Ireland’s diverse flora and fauna, receives State funding of just €11m a year — while €16m of taxpayers’ money is granted per annum to the greyhound industry and a jaw-dropping €64m a year goes to horse racing. In the case of the Irish hare, our leaders do worse than merely fail to cater for its preservation. They allow the capture of these inoffensive creatures every year for use in a cruel blood sport. I saw one of these iconic animals earlier this month — a “mad” March hare frolicking in a sun-lit meadow. A happy scene, but I couldn’t dispel the image of the same animal criss-crossing a muddy field in winter, dogs snapping at his heels. Sir — The ‘sheen-feathered magpies’ have friends (Sunday Independent, March 24), so should I be friends with them, too, those big birds that chase my little robins and blackbirds away; away from the bird-seed I scatter each day, for the small birds that come to our garden to play. Now why are those magpies so greedy, and rough, like the big bullies we disliked at school? But we could all be friends, but that would depend, on those big birds changing their bold ways! Sir — I never cease to be amazed by the illogical attitude of those with little true knowledge of wildlife. Magpies do major damage to songbirds, robbing nests, eggs and tearing fledglings asunder. They have hugely increased in numbers, having no natural predator and being assisted by man through farm feed lots and throwaway fast-food bags. Man has contributed to songbirds’ decline with his cars, cats and habitat destruction and it behoves him to assist species under pressure and control predators such as magpies and grey crows. Which should we help out — the contributors to our magical dawn chorus or the marauding ever-increasing magpie? Sir — So the powers-that-be have finally given us pensioners the €5 a week promised in the Budget. Wow, what are we going to do with it all? Sleepless nights will ensue wondering how we are going to spend it all. Some pensioner ladies will be going round supermarkets with a swagger as they decide whether to buy more washing powder, fruit, a tiny steak for himself or even a chocolate treat to celebrate the increase. Some men will think of a small bag of coal or briquettes to help keep the house heated. The big question is why does the pension increase not kick in at the time of the Budget as most of the old reliables such as VAT and various taxes do. Why should pensioners wait six months to get their increase, with only six months more to wait until the next Budget. We are only getting the equivalent of €2.50 a week, or €130 a year, as opposed to €260. I suppose the Government would be afraid that if we got the pension increase for the full year we might go off the rails altogether, seeing as us pensioners cause them so many problems already, living in houses that are too big and living so long and all that. Sir — I was delighted to read Liam Weeks’s article (Sunday Independent, March 24) acknowledging “so few dissenting voices to this consensus in the Irish media”. Indeed, how well we who are pro-life are aware of this, with no opportunity given to challenge this consensus, whose mantra is “liberal good, conservative bad”. Mr Weeks is certainly correct in stating “it is not necessarily a battle between right and wrong but a battle between different perceptions of what is right”. In a democracy, surely it is not too much to expect a balanced debate on matters of vital importance. Instead, what we get is a blanketing of any argument that does not fit the “cosy consensus” and an obliteration of the facts. Sir — The fuss regarding tennis balls reminds me of the two cats watching a tennis match. “I have a friend in that racket,” says one to the other.